Infab Corporation (Infab), a leading manufacturer of radiation protection products, is pleased to announce the hiring of Justine Peterson and Ryan Wilson. Justine Peterson joins Infab as the new Business Development Director, responsible for planning and executing new strategic business development projects and systems implementation to manage Infabs growing business. Ryan Wilson has been hired as the new VP of Marketing and will be responsible for communicating Infabs sterling record of quality, customer service and transparency to the medical imaging community. We are extremely excited about these two new additions to the Infab team, said Don Cusick, Chief Executive Officer for Infab Corporation. Both Justine and Ryan bring a unique perspective to our organization and more importantly, the radiation protection industry. These two team members are vital to the development and growth of our exceptional radiation protection products and related accessories. Justine Peterson brings years of operations management and business development experience to the Infab team. Her background includes project and operations management in the manufacturing and technology development industry. Her focus has been on business planning, new product development and streamlining processes to maximize efficiency and increase productivity. Ryan Wilson has been in the advertising industry his whole career handling media buying across television, radio and print publications. He has also planned and executed large scale projects and media plans as a project manager for his previous organizations. Ryan is currently a MBA candidate at the George L. Graziadio School of Business and Management at Pepperdine University. The medical industry is full of professionals who genuinely care for the safety of their patients. Infab represents the other side of that equation; everything we produce has the safety of our medical professionals in mind. Ryan and Justine understand this critical mission and we are very pleased to have them on board, said Cusick. Infab Corporations website, http://www.infabcorp.com, was reconfigured in February of this year. It was the first of its kind to offer an apron configurator, allowing clients the most customization options in the industry. Customers can browse Infabs expansive product inventory including lead and lead-free radiation protection aprons, apron racks, x-ray barriers, lead glasses and gloves, lead curtains, cassette covers, lead glass and patient protection options on the website as well. Warranty information, sizing charts and attenuation information for Infabs Smart Armor Standard Lead, Lightweight Composite and Greenlite lead-free material are all available on the website. Infab Corporation manufactures radiation protection apparel and products. All of their products are manufactured in the United States. Infab Corporation is CE certified and an FDA registered class 1 medical device manufacturer and the only one to hold a 501 (k) for lead-free aprons. Infab Corporation is committed to the method and model of quality management described in ISO 9001. For additional information about Infab products, call (805) 987-5255 or visit http://www.infabcorp.com. An estimated 150 Northeast Ohio and statewide leaders today viewed firsthand the technology-filled 30,000-square-foot simulation center in the new headquarters of the Austen BioInnovation Institute in Akron (ABIA). The ABIAs open house was the first opportunity for many of the officials to see the headquarters, which is among the leading research and training centers of its kind in the country. The building features healthcare technology and simulation space meant to improve training for the entire medical team and first responders to improve education and patient care, as well as providing space for product development and commercialization. Companies and organizations from across the country and Ohio already have used the new facility to improve their training or test products. The ABIAs Center for Simulation and Integrated Healthcare Education (CSIHE) is one of the largest of its kind in the country, and offers space that includes a mock hospital complete with triage, nursing, surgical, perinatal, intensive care and emergency and operating rooms. The center also features a unique bioskills cadaver lab that can be utilized by numerous medical and engineering specialties to work on more streamlined and effective procedures, as well as allowing for the efficient training of industry sales and design teams. Thanks to the support of the Knight Foundation and our founding member institutions Akron Childrens Hospital, Akron General Health System, Northeast Ohio Medical University, Summa Health System and The University of Akron Akron and Northeast Ohio now have a spectacular asset that will impact healthcare training and biomedical device innovation across the country, said Dr. Frank L. Douglas, president and CEO of ABIA. Our ongoing mantra is The patients are waiting. And this new headquarters will help the healthcare sector improve patient care while accelerating innovation, growing the health and medical device space in Akron and Northeast Ohio and thus create jobs. The headquarters represents a rare combination of research and biomedical product development expertise that few communities possess under one roof. Akron, traditionally a manufacturing city, was always at the forefront of developing new products through research and innovation, said Mayor Don Plusquellic. ABIA continues in many ways that tradition but in a more highly technical, hi-tech arena as innovators of medicine, biomedical research and materials handling. The ABIA is the result of the cooperative spirit that exists in Akron and should ultimately lead to the jobs of the future through commercialization of the new ideas, products, and procedures developed by the world-class researchers at ABIA. During the open house, guests took part in a live disaster demonstration that highlighted just some of the centers many capabilities and included use of a decontamination tent, trauma bay, the intensive care unit, mock operating room, bioskills lab and a standardized patient room. Actors played the roles of patients involved in an emergency, and ABIA professionals demonstrated the functions of each station meant to improve training for the entire team of medical and health professionals. “The Austen BioInnovation Institute in Akron represents the unlimited potential we see in Northeast Ohio to out-innovate and out-work the rest of the world, said U.S. Rep. Betty Sutton. Too often we are referred to as the Rust Belt, but the innovation on display today, utilizing our regions strengths in medicine and industrial and materials science, shows we really should be called the Opportunity Belt. I am proud to have been a partner in this progress, helping to deliver the resources necessary to help make today possible, and I look forward to working with the great men and women of this critical part of our community for years to come. When commenting on ABIAs leadership, Knight Foundation President and CEO Alberto Ibarguen said, We all know that we have hit a home run in that department with Dr. Douglas. Today we are celebrating a model of excellence in Akron, he added. Nobody should be fooled that the ABIA is a done deal. This is just the beginning. That should leave all of us with a great deal of hope. The ABIA facility, built in 1917, was once the original headquarters and train terminal station for the Northern Ohio Traction & Light Company, which was a power company that eventually became Ohio Edison and operated nearly 300 miles of electric railways. After extensive renovations, ABIA executives moved into the headquarters in May and have been adding equipment for the training facilities during the summer. A mix of public and private funding from the Development Finance Authority of Summit Count, ABIA, FirstEnergy, Summit County and the State of Ohio helped to finance the project. The ABIA may represent the best of our community collaborations and will help position our city and our county for future good-paying jobs and opportunities, said Summit County Executive Russ Pry. In addition to the simulation center, the facility also houses three of ABIAs other Centers of Innovation Medical Device Development Center, Center for Clinical Trials and Product Development and Center for Community Health Improvement and rapid prototyping capability, an auditorium, meeting and educational spaces, an Akron location for the Northeast Ohio Medical University and more. A fifth center, the Center for Biomaterials and Medicine, is located on the campus of The University of Akron. This new facility marks a turning point for Akron, Northeast Ohio and the biomedical device sector, Dr. Douglas said. In conjunction with our partners, we have the capacity to do some amazing things in Akron. The culture of innovation is growing here. There are even more exciting times ahead. Technology training provider InfiniteSkills Inc has released a new Corona SDK Tutorial Video Course aimed at teaching iPhone, iPad and Android device development using the popular system’s interactive software tools and simplified Lua scripting language. Narrated by Professor Rafael Hernandez, the 7.75-hour tutorial video course can be ordered on a Mac and Windows-compatible DVD-ROM or downloaded from the InfiniteSkills website. The package includes 96 training videos that cover a wide range of topics and features accessible project files that enable viewers to follow along. The Corona SDK training starts with the installation and setup of the Corona development environment and walks viewers through the creation of their first project. The training then moves through the structure of the Lua scripting language and goes through each major stage of app creation, with hands-on examples at every point. Used by more than 100,000 mobile developers, Corono SDK has become a leading solution for producing apps and eBooks for mobile digital devices. Graphic design and advertising agencies have used the platform to leverage existing content into mobile formats and extend branding opportunities for clients around the world. After introducing the basic concepts of the Lua scripting language, the Corona SDK training shows how to add images, shapes and text and then gradually introduces levels of interactivity. The Corona tutorials cover animation, object physics and multimedia support such as the ability to play native video and use the device’s built-in camera and location tools. Next, the course shows how to properly capture and act upon user input such as text fields and forms, and how to use extensible interface widgets to build more intuitive user interfaces in a minimal amount of time. The final chapters of the Corona SDK tutorial cover data management such as the ability to write to backend databases, how to use Network APIs and how to debug and then build fully functioning apps. As a professor of music and director of the multimedia graduate program at CSU East Bay, Rafael Hernandez has developed educational resources, games and interactive mobile apps using Corona SDK and other tools. In addition to the Complete Corona SDK Training Video course for InfiniteSkills, his tutorials have been featured on the official Corona Labs website and throughout the mobile development community. 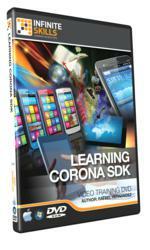 The full Corona SDK Tutorial Video Course can be ordered for $ 99.95 USD from the InfiniteSkills website on DVD-ROM or as a direct download. Shipping and ordering options are available for customers worldwide. Managing and assuring quality in a widget development effort presents some challenges in regards to best practices and defining areas of responsibility. Due to the varying nature of functionality from the data sources widgets may be using, defining what layers or tiers are needed by a widget in general is challenging. The design choices that are made to satisfy the needs of a widget will also affect the basic architecture. This document sketches out general patterns seen in widget development and what implications these patterns have for implementing best practices. Additionally, this document attempts to define what constitutes a widget to establish the area of developers responsibilities for development and support. The influx of Internet businesses has created a need for custom commercial websites. Sidereal Designs is a leading expert in flash design, content management systems and databases, e-commerce operations, and custom, complex back-end coding. Los Angeles Internet marketing company LAD Solutions has recently teamed up with Sidereal to lead the promotion, and its aim is to further enhance the professional service of this brand. What makes Sidereal different from its competition is its ability to create custom websites that are professional and tailored to the needs of each client. Sidereal Designs works toward finding a solution for each client, and its web designers build content management systems that incorporate specialist web pages that can be updated and maintained by the client. What is also explained on their informative website is the process of moving a business to an Internet-based e-commerce market. It can be confusing enough to want to make the move into e-commerce, but without the knowledge from experts like Sidereal, who prepare all aspects of its clients web presence, such as email facilities, mailing lists, auto-responders, credit card transactions, shopping carts, payment processing, graphic design, production, database, content on-demand, production, design and installation of websites, and interactive pages, the move can cause undue stress. Sidereal can even reconstruct an existing website. Experts in Joomla and Sharepoint, Sidereal provides its clients with custom website design and develops websites by incorporating their knowledge of expert e-commerce solutions, interactive websites, web page design, and content-management systems. The complete web development service offered by this company is incorporated into one flat fee that covers analysis, website development, coding, inauguration, and testing. Even better is the free estimate offer, which enables Sidereal to see if they can assist your business endeavors. All this requires is filling out a form, which can be easily found on the companys website, which allows you to detail out your needs and overall budget. Sidereal explains the base price of a multi-function website is $ 9,500, whereas commercial, professionally coded websites can cost anywhere from $ 10,000 to $ 75,000. It is also estimated that some websites can cost millions, dependent on their complexities and goals. A basic informational site with several additional functions can cost anywhere from $ 2,500 to $ 5,000. Sidereal Designs is based in Boyds, Maryland, near Washington, D.C., and its experts include graphic artists, webmasters, Internet specialists, and coders who produce complex custom web sites, database structure, and related communication tools to meet the needs of their clients. Their company structure allows them to produce both small and large-scale websites, and its latest technology covers dynamic pages, e-commerce applications, multimedia, and online content management. The companys website is informative with easy navigation. While many website design companies may charge a consultation fee, Sidereal Designs offer a free estimate. LAD Solutions will use their knowledge and expertise to promote Sidereal Designs. About Sidereal Designs: Its headquarters is located close to Washington, D.C., and its team of experienced coders, Internet specialists, graphic artists, and webmasters work with clients to create custom websites. The team at Sidereal Designs uses Internet technology to cooperate in real time, and staff members are based in Canada, Australia, New Zealand, and the United States, with a development center in Jaipur, India. At #1 Web Development Company Of India, Profit by Outsourcing has announced its iPhone Application Development Services, they excel at developing next generation iPhone Applications, tailor-made to suit any requirements of the most. They offer industry specific and customized solutions for iPhone applications development. Their team of developers are knowledge rich and expert in the development of various iPhone Applications in niche areas like games, finance, sports, entertainment, news and education. The iPhone 3G is a revolutionary phone which combines the features of touch screen, iPod and high level internet into one gadget. Along with this, the users can also download third party applications into their iPhones. It is here that Profit by Outsourcing can really assist business owners on the web with the design, research, development and deployment of various iPhone applications. As the web design company Located in India have rich expertise in the overall iPhone apps Development, one can be assured of the best iPhone development service. They co-ordinate with the clients right from the beginning and work with them through the prototyping and graphics designing stage till the actual deployment of the application. Besides these, their concept development process includes analysis, research and detailed evaluation of the scope of the iPhone application development and the targeted users. This helps to bridge the gap between demand and supply, and thus provides the platform for better results. At Profit by Outsourcing, ensure that the iPhone application project is developed on time with substantial cost advantages. They always make sure that the best practices are used while completing the project, and take extra care to meet all the business requirements of their esteemed clients. Profit By Outsourcing has dedicated developers and designers who apply their expertise and knowledge in creating some of the best iPhone applications. Their seasoned iPhone Application developers have worked on some of the most updated technologies and tools for developing iPhone applications like Xcode, Cocoa Touch framework and Objective C. By using cutting-edge technology like Cocoa’s APIs, their professional iPhone developers can create a consolidated Xcode environment. Such Xcode development environment makes the addition of multimedia like animation, graphics and video quite easy into the iPhone application. Besides the conceptualization, development and deployment of the iPhone application, Profit by Outsourcing also provides support and maintenance, and ensures that every bug or risks associated with the application is removed pro-actively. With the extensive experience and deep industry expertise, Profit By Outsourcing is able to comply with diversified iPhone applications development needs and deliver the best quality of service. Profit By Outsourcing is an Offshore Web Design Company in India specializing in PHP Programming, ASP.Net Programming, AJAX Programming, RoR Programming, Custom programmed Content Management & E-Commerce Solutions/ Open source Customized Content Management & E-Commerce Solutions, Web 2.0 Designing ( 100% table less or div based designs) developed in xhtml / css as per the w3c guidelines and Rich Internet Applications (RIA’s) are applications built using Adobe Flash Flex AIR Action Script, Adobe Flex, Adobe Flex(AIR), Microsoft Silverlight, Sun JAVAFX & AJAX and Web 2.0 Application Development. Visit http://www.profitbyoutsourcing.com or call (888) 322-7617 for more information about Magento Development and other services provided by Profit By Outsourcing.